DUSHANBE (HydroWorld) — The Asian Infrastructure Investment Bank has approved a $60 mln loan that will be used to help Tajikistan rehabilitate its 3,000 MW Nurek hydroelectric plant. AIIB’s funding for Nurek is part of a larger $324 mln infrastructure investment package, which also includes non-hydropower related money for projects in India and Georgia. Located on the Vakhsh River, construction of the Nurek project began in 1961 when Tajikistan was still a republic of the Soviet Union. 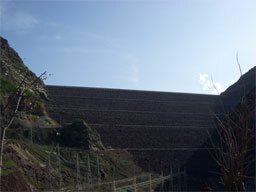 The dam is the second tallest in the world at 300 meters high. The financing will go toward Phase 1 of a three-part modernization effort, AIIB said, with the initial stage to include the rehabilitation of three generating units and the replacement of six transformers. Phase 1 includes seismic safety upgrades to Nurek Dam in response to a 2012 study conducted by owner Barki Tojik. “These three projects demonstrate a growing sophistication in our ability to support our member countries across different regions and sectors”, AAIB vice president and chief investment officer D.J. Pandian said. The Tajik government said the first phase of the rehabilitation will begin this year and is scheduled for completion in 2023. Work on the second phase is expected to begin in 2019. The government has previously said Nurek’s operation is essential for the country given that it provides about 70% of the country’s total power. The project has not had a major overhaul since its commissioning in 1972, however, and currently operates at less than 80% of its capacity. Additional financing for the project has come from the Eurasian Development Bank and International Development Association, which approved $225.7 mln in financing for the project in May.